About Foofaraw Shawlsticks - Dress Up With Foofaraw! Your jewelry box, the local thrift shop, and the fabulous boutiques that you love or stumble upon are treasure troves for bangle bracelets that you can accessorize your Foofaraw with. Metal bangles can be carefully bent into an oval, or other creative shapes. Elastic bracelets work as well, and can be twisted around, or used in an oval shape. 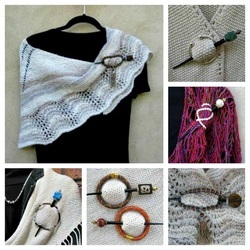 The Foofaraw Crochet Ring Pattern is available for download on Ravelry. It starts with a metal bangle bracelet which you can shape and then cover with the yarn of your choice.